As the snowstorm starts to swirl out of Colorado Thursday, it's leaving icy and snow-packed roads in its wake. We're tracking the latest on road closures and conditions, as well as traffic. This page will be updated as new information comes in. To view Wednesday's live weather and traffic blog, click here . 11:14 a.m. — CDOT has issued a correction , saying that eastbound I-76 is indeed still closed between Sterling and the Nebraska border. There is no estimated time of reopening. U.S. Highway 34 is back open between County Road 54 and I-76. 10:54 a.m. — Though CSP had said eastbound I-76 would stay closed from Sterling to Nebraska, the interstate is now open in both directions, according to CDOT. 10 a.m. — Colorado State Patrol says westbound I-76 from Nebraska to Denver has reopened. Eastbound I-76 will stay closed for the rest of the day from Sterling to Nebraska because of conditions in Nebraska. “Now that roads are reopening it does not mean they are completely clear and dry. You still have to drive with regard for the conditions. The speed limit may not be appropriate! Bridges freeze first but thaw last. Slow down for CDOT plows and emergency vehicles. Be nice!” CSP Sterling tweeted. 9:05 a.m. — We're getting a look at snow totals from the storm. The Fort Garland area is the winner with 10 inches, but several other areas were close behind. 8:19 a.m. — I-70 has reopened at the Eisenhower Tunnel after a safety closure. Some highways are still closed -- particularly out east. Interstate 76 is still closed from Lochbuie to the Nebraska state line and Highway 34 remains closed east of Kersey to Wiggins. 8:06 a.m. — Interstate 70 is now open in both directions between Denver and the Kansas border after eastbound lanes opened between Airpark Road and the Kansas border. 7:59 a.m. — There is a safety closure in place on westbound I-70 at the Eisenhower Tunnel because of a crash west of the tunnels. CDOT says there is no estimated time that the highway will reopen. Meanwhile, Highway 86 in Elbert County has reopened as well. CSP says that I-25 between Castle Rock and Monument is open but winter driving conditions still exist. 7:30 a.m. — Highway 287 northbound is now open from Lamar to Limon. 7:22 a.m. — The northbound lanes of Sheridan Blvd. (CO-95) are closed between 25th Avenue and 26th Avenue. All lanes are blocked here. 6:53 a.m. — The westbound lanes of I-70 from Limon to Denver are now open. Authorities are working to open both directions of the highway at Airpark Road now. 6:31 a.m. — The crash at 6th Avenue and Kiping has cleared. 6:15 a.m. — A new crash has been reported in the eastbound lanes of 6th Avenue at Kipling Street in the right lanes. 6:07 a.m. — A crash at 32nd and Kipling is causing issues, as the hill in this area is slick and smaller cars are having a hard time getting to the top. 5:56 a.m. — A new crash has been reported in the southbound lanes of I-25 at Logan. Another crash has been reported in the northbound lanes at 38th. 5:45 a.m. — The crashes reported at northbound I-25 at Evans, northbound 225 at Alameda and westbound Highway 36 at Wadsworth have all cleared. 5:35 a.m. — There is a report of a rollover in the southbound lanes of 225 to southbound 25. The Denver Fire Department has staged in the right lanes of northbound I-25 at Evans. 5:11 a.m. — RTD says it has not found any weather-related issues. 4:57 a.m. — A crash in the northbound lanes of I-25 at milemarker 177 is blocking two lanes. 4:38 a.m. — Denver International Airport received a little more than two inches of snow. Emily Williams, spokeswoman with the airport, said crews worked overnight to clear the airfield and roads. Runways are open and they expect most airlines to start operating as normal by the early afternoon. Pena Boulevard remains snow-packed and icy. As of now, 180 flights have been canceled for Thursday. Passengers should check with their airlines to see flight status. 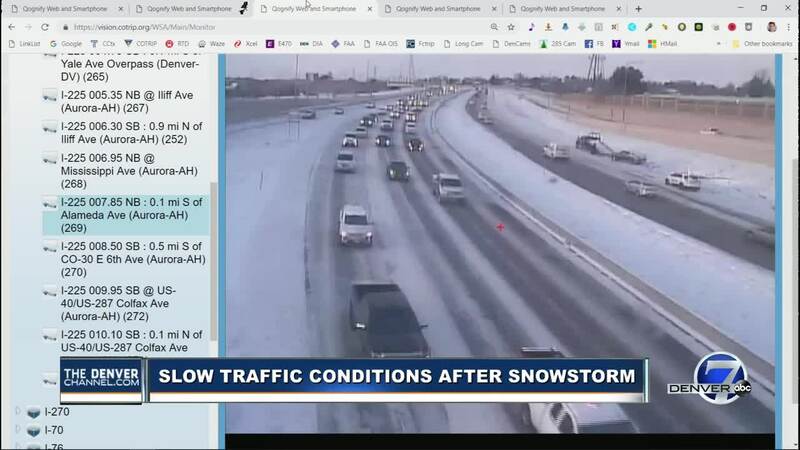 3:50 a.m. — Denver7's traffic reporter Jayson Luber has listed out highways that are still closed as of now. 3:30 a.m. —US Highway 34 from Kersey to Wiggins is closed due to the poor conditions on I-76. 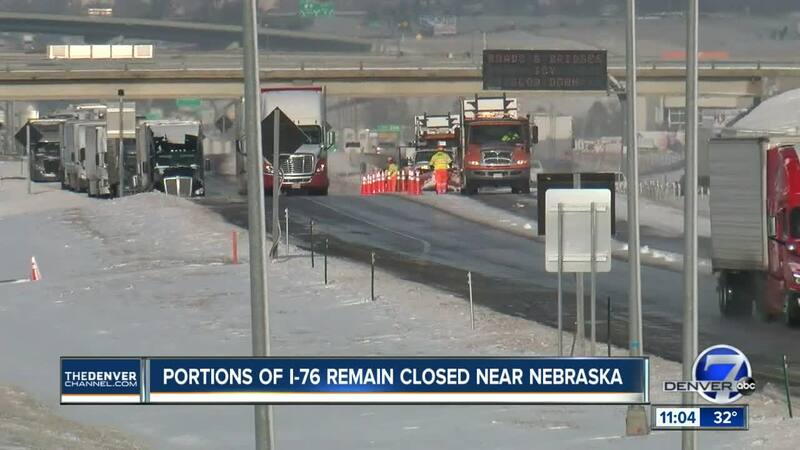 I-76 is closed from Lochbuie to the Nebraska state line. CO-86 is closed in both directions from Elizabeth to I-70 and I-70 eastbound is closed from Airpark Road to the Kansas border. 3 a.m. — A blizzard warning remains in effect in the northeast portion of Colorado until noon Thursday. 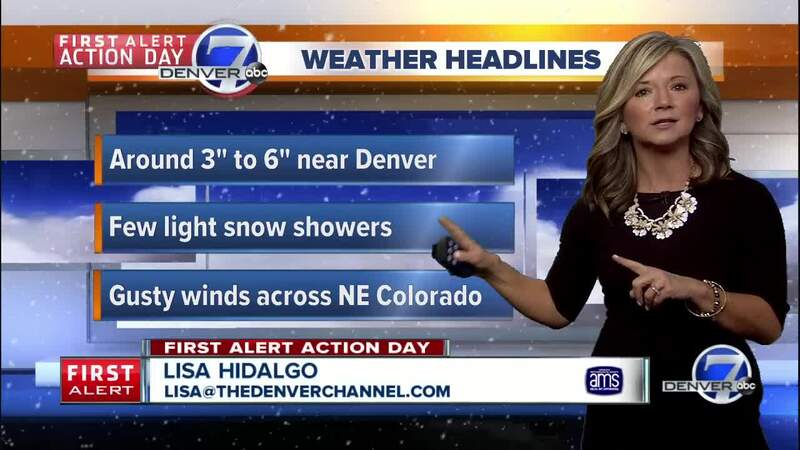 The Denver metro area is in a winter storm advisory until 10 a.m. Much of the mountains remains under a winter storm warning today.